What to wear for Halloween? It's the perennial question. But Lulu hasn't given it much thought. After all, she is Ladybug Girl! "AGAIN?" SAYS HER BROTHER. YOU'RE ALWAYS LADYBUG GIRL! "YOU SHOULD BE SOMETHING DIFFERENT!" It's an arresting thought for Lulu, who has to admit that her brother is right. Maybe she should find a new costume for Halloween. She collects some boxes and puts together a robot costume. But it's too boxy. She can't even get out the door for trick-or-treating wearing that! How about some facepaint to turn her into a vampire panda! Her brother pronounces that the silliest idea ever. "A SILENT MOVIE STAR CAN'T ASK FOR CANDY!" Just as Lulu realizes the costume's fatal flaw, her parents call them to get ready for the annual expedition to the apple orchard and pumpkin patch, so Lulu puts on her customary Ladybug dress and wings and heads out for some apple-picking, on the lookout for an inspiration for a different costume while she's at the farm. Scarecrow? Pumpkin? But they've all been done! Then on her solitary trek through the corn maze, Lulu is distracted by a small girl who is obviously hopelessly lost from her family. How to help? "THIS IS A JOB FOR LADYBUG GIRL!" Ta-Da! Lulu's dog Bingo notices right away that the little girl has a half-eaten bag of popcorn, and taking her hand, Lulu leads her back along the trail of dropped popcorn the way she came, with Bingo taking care of any "littering" as they go. 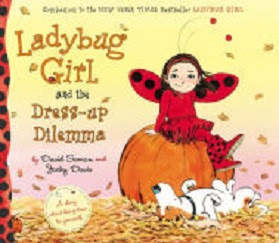 It's another problem winningly solved by Ladybug Girl, and Lulu decides to stay in character for trick-or-treat after all, in David Soman's latest in his best-selling series, Ladybug Girl and the Dress-up Dilemma (Dial Books, 2015). Soman's storytelling is succinct and well-paced, as the Halloween rituals unfold while Lulu deals with disturbing thoughts of breaking out of her usual persona, and his evocative illustrations of the harvest scene and the throngs of costume-clad trick-or-treaters are as charming and filled with eye-catching detail as ever. "Soman's watercolors are right at home with autumn's muted hues ... helping make this thoughtful story another winner for Ladybug Girl." says Publishers Weekly.